The circuit Diagram this Bluetooth controlled LED board built using the EasyEDA application. We will use the same schematics to develop a PCB from it and fabricate it using EasyEDA. The circuit is pretty straight forward. The whole project is powered by a 12V adapter, which is directly given to the Raw pin of the Arduino Board. This Raw voltage is then regulated to +5V which is supplied to the Bluetooth module and the MAX7219 IC. The Tx and Rx pins of the Bluetooth module is connected to D11 and D10 of the Arduino to enable serial connection. The digital pins D5 to D7 is connected to the MAX7219 IC to send and receive data through SPI communication. The ISET pin of MAX7219 is pulled high through a 20k Resistor. Before we can start programming our Arduino, we should know what type of data we will receive form the mobile phone to respond back to it. 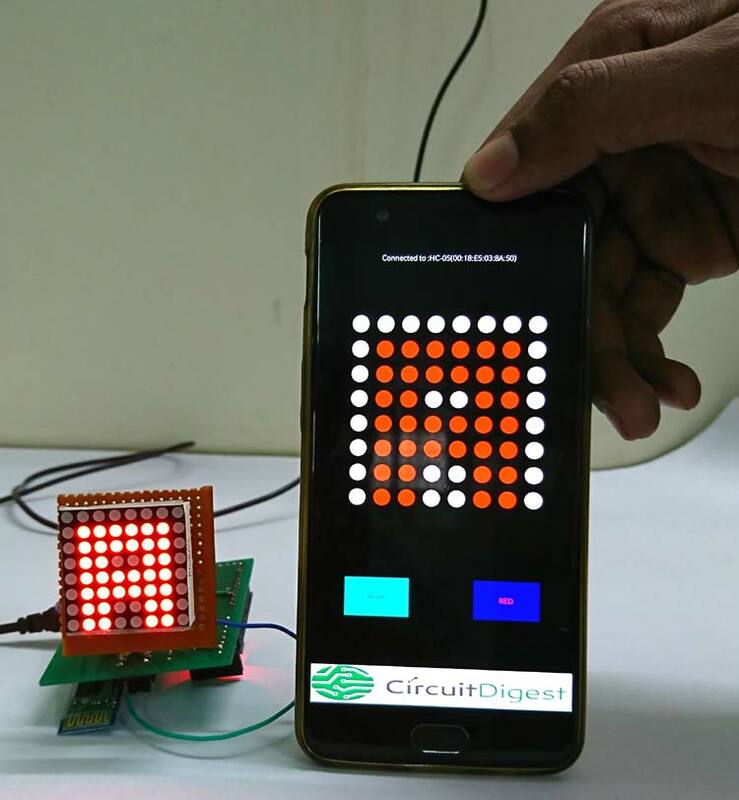 So let’s take a look at how the Android application is created and how you can use it on your smartphone to control the 8x8 LED matrix. The Android application for this project was created using the Processing software. It is an Open-Source development application and can be easily downloaded and put to use for developing interesting projects using Arduino or other Microcontrollers since it can develop android application and system applications. We have already done few projects using Processing and you can check them out by clicking on the links below. Private Chat room using Arduino. The APK file can be directly installed on any android application and launched like any other application. But make sure your HC-05 Bluetooth device is named as “HC-05”, because only then it will work. People who are interested to know what happens behind the screen can read further, other can skip down to the next heading. Basically the Android application connects to a Bluetooth device called “HC-05” during start-up and display a set of 64 LEDs in form of circles. Then when the user presses the circle the circle turns red and the circle number is sent to Arduino through Bluetooth, on receiving the circle’s number the Arduino turns on the LED. Let’s look into the important lines of the Processing program to understand better. The complete code of the Android application can be downloaded from the below link. We use classes and objects to display 64 LEDs so that we can address each one easily. As you can see in the below code, we use a for loop to iterate from 1 to 64 using an array. This was each LED will have its own value of X position, Y position and colour and we can change them easily. The LED’s are loaded on the screen on the same order of that of the display. Each LED is separated by a distance equal to the diameter of the LED, this way we can easily distinguish which LED is currently selected by the user. As shown in the below program we create an array in which each element holds the information of the X,Y position and colour of the LED. The main step in the program is to check if the user has pressed any LED and if yes we have to change the colour of the LED and send the LED number through Bluetooth. Since now we can address to the location and colour of each LED easily we can do this by just comparing the X,Y values of where the user has pressed with the X,Y value of the LEDs. If the values merger into each other then we change the state of the LED and also send the number through Bluetooth as shown below. Apart from this, the program can also Reset the complete LED by turning off them all and also you can either make an LED turn red (ON) or white (OFF) so we also have an toggle button for that. The toggle button is displayed and waits for the input. If pressed the respective action will be taken. The code to do the same is shown below as function which is called inside the draw loop. The complete Arduino program for this Bluetooth controlled wireless Board project is given at the bottom of this screen; you can use it directly and upload it on your board. The important lines in the program are explained below. Using the values of incoming we have to determine which LED the user has pressed on the mobile phone and weather to turn ON or OFF that LED. So we check if the value is equal to 100. If the value is 10, then it means the user has asked to toggle the colour of the LED. So we toggle the variable red to know whether the LED should be turned on or off. To design this Bluetooth Controlled Matrix display, we have chosen the online EDA tool called EasyEDA. I have previously used EasyEDA many times and found it very convenient to use since it has a good collection of footprints and it is open-source. After designing the PCB, we can order the PCB samples by their low cost PCB fabrication services. They also offer component sourcing service where they have a large stock of electronic components and users can order their required components along with the PCB order. You can view any Layer (Top, Bottom, Topsilk, bottomsilk etc) of the PCB by selecting the layer form the ‘Layers’ Window. After completing the design of this Bluetooth Controlled Matrix PCB, you can order the PCB through JLCPCB.com. To order the PCB from JLCPCB, you need Gerber File. To download Gerber files of your PCB just click the Fabrication Output button in EasyEDA editor page, then download from the EasyEDA PCB order page. After you have selected all of the options, click “Save to Cart” and then you will be taken to the page where you can upload your Gerber File which we have downloaded from EasyEDA. Upload your Gerber file and click “Save to Cart”. And finally click on Checkout Securely to complete your order, then you will get your PCBs a few days later. They are fabricating the PCB at very low rate which is $2. Their build time is also very less which is 48 hours with DHL delivery of 3-5 days, basically you will get your PCBs within a week of ordering. After few days of ordering PCB’s I got the PCB samples in nice packaging as shown in below pictures. And after getting these pieces I have soldered all the required components over the PCB. In my PCB, I made a blunt mistake by selecting the wrong footprint for the 8*8 Display module, hence I had to use an Perf board to mount the display as shown in the picture. But now the footprint is updates in the PCB and you can order the corrected PCB and mount the display module with ease. Once you’re ready with the Hardware either through getting the PCB or making the connection on breadboard, use the Arduino program given at the end of the page and upload it to your Arduino Board. The android application APK file is also provided above, use it and install the application on your preferred Android device. Power the hardware and search for HC-05 device name on your phone to pair with it. The pass key will be 1234 by default. After that, open the application that we just installed. The application should display “connected to HC-05” at the top of the screen, then you will be able to touch the LED on the screen and notice that the same LED is being turned on in the board as well. You can also turn off all the LED by pressing the Reset button and decide to turn on or off a particular LED by pressing on the Toggle button. By default which ever LED you press will be turned on. The complete working of the project can be found in the video below. If you have any problem in getting it to work use the comments box below or write on our forums for more technical help. Hope you understood the tutorial and enjoyed building it.